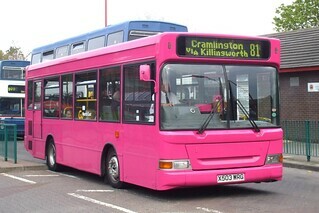 Following service changes effective Sunday 30th March 2008, this vehicle has received "Pink Panthers" branding. 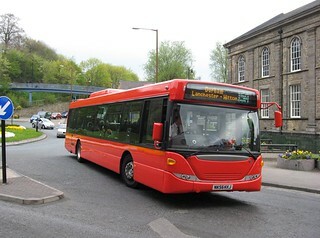 This brand name was first used on a fleet of Optare Solos from Chester-le-Street to operate new service D4 in Durham starting 2 October 2006. The service was unsuccessful and withdrawn on 31 December 2006. The small fleet of pink Solos were sent to Percy Main, a big user of the type at the time, and were pressed into service on services 321 and 322 from 13 January 2007. 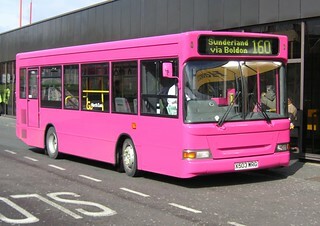 This arrangement lasted until 26 March 2007 when the North Tyneside service network was rearranged with services 307 and 319 gaining the Pink Panther brand. 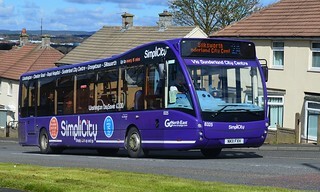 The service changes effective 30 March 2008 has resulted in the new service 81, operating between Cramlington and Holy Cross, being encompassed within this brand identity instead. 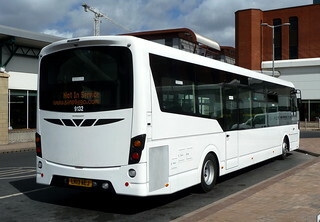 This vehicle has transferred from Deptford Depot to Percy Main. This vehicle has received minor modifications to its special promotional livery for radio station Sun FM, including new logos for both Go North East and Sun FM. This vehicle has been acquired by Go North East for a demonstration trial to compare against other new single deckers available on the market.